So, sure. We’ve all had those days where we wish we could say a couple words, wave a wand, and all our problems would be—hey presto! Gone. And we’ve all probably wished this when our mom/grandparent/sibling/aunt/father/annoying boss patronizingly asked us to “use the magic word…. !” (No? Only me? Well, work with me here). Below is a list of magic words and their origins you might try for the next time you’re feeling intrepid (or more than a little ticked off). 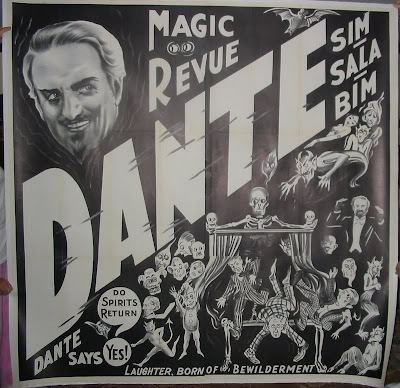 A prime example of the extents to which some magicians will go to seem exotic, this whimsical phrase was first used in magic by Dante the Magician, a.k.a Harry August Jansen one of the most well known magicians of the early 20th century, whose death is commonly considered the end of the “Golden Age” of magic. He utilized the phrase as a means of acknowledging applause, as well as for the title of his touring magic shows. Apparently, in typical audience whoring fashion, he claimed that the words meant “a thousand thanks”, and that the more people applauded, the more ‘Sim Sala Bim’ thanked them. Although this nonsensical combination actually originates as filler in German nursery rhymes, including one specific folk melody called “High on a branch a cow”, this phrase grew to be representative of the integration (and manipulation) of the mysterious Eastern culture, specifically Indian, in an effort to employ a sense of mysticism in illusionist’s acts. This device of Eastern supernatural typecasting in Western culture, and in fact these exact words, were used as early as the medieval period, in the play Robyn Hode: A Mummer’s Play, wherein the Turkish magician Saracen states: “I have here a potion, brought from the east. It is called the golden elixir, and with one drop I will revive Robyn Hode with these magic words: ‘Sim Salabim.’ Rise up young man and see how your body can walk and sing.” This othering attachment has continuously followed sim sala bim, as clearly evidenced by the Jonny Quest series, with the highly stereotypical sidekick figure Hadji, who additionally adopted these magic words when he performed his mystical feats—levitation, snake charming, hypnotism, and other magical qualities every Indian must possess (the producers never having bothered, apparently, attempted to look up the very WASPy origins of the words). Another attempt by magicians to align with the mysticism associated in the Western world with Indian culture, ‘open sesame’ is an anglicized bastardization of the magic words that opened the cave in the tale of Ali-Baba and the Forty Thieves (it’s actually “open, Simsim). Basically, Ali-Baba, the “honest man” whose brother has stolen his fortune, follows the bandits to their cave hideout, learns the password, and starts thieving from the thieves. His greedy brother finds out about the treasure cave, and tries to get in on some of the wealth. He gets so excited when he’s in with all the treasure that he forgets the words to open the cave, and is brutally murdered and quartered by the thieves. Ali-Baba, afraid for his reputation, realizes that he can’t let his brother be seen this way, so he hires a (blindfolded) tailor to sew him back up again for the burial. Nobody asks any questions, and they live happily ever after. Today, this is one of the most commonly used “magic words”, lending credence to can openers, garage door openers, restaurants, etc., etc. I guess they don’t know it’s evidently a really forgettable phrase. This ancient combination, like abracadabra, has a fairly ambiguous back story, with multiple theories as to exactly where and when this term originated. Some think that it is merely a fake Latin incantation, hax pax Deus adimax, used, like the Indian mystique, to create a certain authoritative otherworldliness to the particularly magicians tricks. Another, far more interestingly controversial conjecture is that hocus pocus is a parody on the Roman Catholic rites of communion, specifically the incantation occurring at the moment of the transubstantiation of the Eucharist , hoc est enum corpus meum (so the magician, as priest, brings out the rabbit, as Jesus’s body, from the hat, as wafer). Yet another theory is that these words derive from the Norse magician/demon, Ochus Bochus, and that the incantation is calling out his spirit to help with the magic. Although the word has come to mean trickery with an extreme connotation of bogus, hocus pocus is one of the oldest terms used specifically by conjurers and illusionists of all sorts as a magical incantation.